Wow, they are Crazy, Fun, Outgoing, Social! Didn’t matter what I put in that blank, or what songs they requested the dancing did not stop! The wedding reception was intense. Joe and Shannon have a GREAT family! We went an additional hour of overtime. I wish I could show you all the photos we took, lol they are hilarious! The banquet hall was pretty big, but we we able to distant our speakers apart to get more coverage in the space. It is very important that the company you work with has a good knowledge of sound acoustics. If you were to setup in the space with the wrong layout, then it would affect some of the more important parts of the reception. For example, no one would be able to hear the announcements including the toasts. It is crucial that guests understand what is happening and when. You want to ensure they have a heads up and are able to take photos and videos of the important formalities throughout the night. What I loved most about this reception was taking the photos. We captured about a dozen great images of guests packed on the dance floor. It didn’t matter what we played, the family would just keep on making requests and we keep on playing them. I must admit they really loved top 40 and rock. A majority of the music was Kid Rock. There’s one picture in there with Joe holding a dollar in his mouth standing in a chair over a girl WITH his bride Shannon next to him. Family tradition, or just random acts of alcohol? I’ll let you decide. As I said in other parts of this website we don’t do cookie cutter receptions. So if you are looking for something less conservative then we will live up to those standards. This couple knew exactly what they wanted and were able to drag and drop their songs directly off of our interactive website. We guaranteed to have any song they wanted before the reception. So are you planning a reception in the Ohio area? We do wedding receptions beyond Michigan all the time, and would love to help you with planning yours. Be sure to check our availability if you are looking for a fun wedding DJ in Toledo Ohio. Also keep in mind that we do more than just disc jockey entertainment. 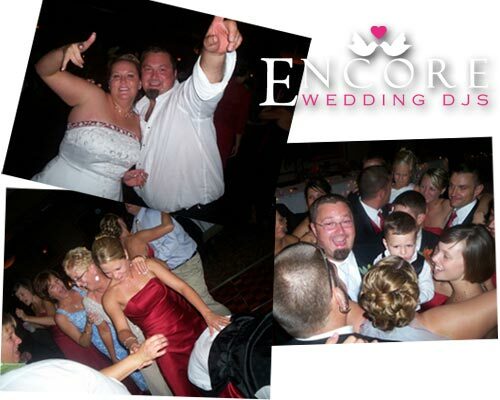 Encore also provides photo booth and lighting design services.